Vice President Joe Biden made the opening and closing remarks at Wednesday's White House Cancer Moonshot Summit. 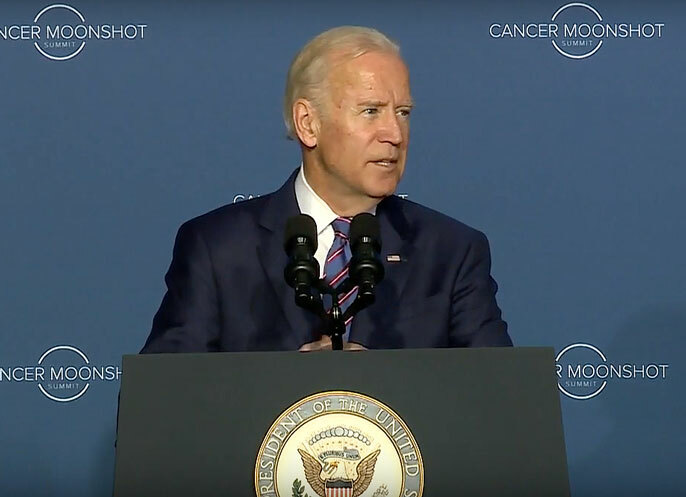 At the White House’s Cancer Moonshot Summit on Wednesday, Vice President Joe Biden announced new actions to speed progress toward ending cancer as we know it, with several efforts involving the University of California. The University of California committed to a new transformative model for health care delivery for breast cancer patients. A strategic computing partnership between the National Cancer Institute and several national laboratories, including Lawrence Livermore and Los Alamos, to apply advanced supercomputing to analyze preclinical and molecular interaction data. The creation of an open access resource for sharing cancer data through the NCI’s Genomic Data Commons, which involves UC scientists. Hundreds of researchers, medical professionals and industry leaders gathered together at the summit in Washington, D.C., including Laura Esserman, who is director of the UC San Francisco Carol Franc Buck Breast Care Center. Esserman led the UC breast cancer proposal, titled “OneSource,” a joint commitment from the UC Office of the President, UC Health, the Athena Breast Health Network, Quantum Leap Healthcare Collaborative and Salesforce. The breast cancer initiative proposes introducing the use of standard checklists for cancer care documentation as well as enabling feedback and multiple connections to registries, trials and research. The new model evolved from experience that includes personalizing screening and prevention for more than 100,000 breast cancer patients in the Athena Breast Health Network and the launch of the Patient-Centered Outcomes Research Institute-funded WISDOM study. Summit attendees also included Livermore Lab Director Bill Goldstein. The Livermore, Los Alamos, Oak Ridge and Argonne national laboratories will participate in three new pilot projects to apply the nation's most advanced supercomputing capabilities to analyze data from preclinical models in cancer, molecular interaction data and cancer surveillance data. For example, the Collaboration of Oak Ridge, Argonne and Livermore (CORAL) supercomputing, led by Lawrence Livermore, which is typically used for stockpile stewardship, will be applied to biology to refine the understanding of the mechanisms leading to cancer development and accelerating the development of promising therapies that are more effective and less toxic. "The Moonshot cannot be achieved by one person, one organization, one discipline or even one collective approach," Biden said. "Solving the complexities of cancer will require the formation of new alliances to defy the bounds of innovation and accelerate the prevention, diagnosis, treatment and – ultimately – a cure." In January, President Obama signed a memorandum establishing a first-of-its-kind federal task force, chaired by Biden, to end cancer as we know it. One of the key discoveries in that effort is CRISPR/Cas9 , a gene-editing technique pioneered by Jennifer Doudna, a UC Berkeley professor of molecular and cell biology and of chemistry. CRISPR/Cas9 allows for fast, precise editing of very small portions of the genome. Doudna met with Biden during January’s World Economic Forum in Davos, Switzerland, to discuss how the technology could be used to combat various forms of cancer. “We can harness the power of the human genome to understand disease,” Doudna tweeted at the time. In February, Biden and his wife, Jill Biden, visited UCSF as part of a national “listening tour” they launched to better understand the state of cancer research and care. In March, Chancellor Sam Hawgood and other top UCSF leaders met with the vice president’s staff in Washington, D.C., to follow up on a number of issues the vice president raised during his campus visit. In April, UCSF’s Mitchel Berger and Jeffrey Bluestone were named to a Blue Ribbon Panel of scientific experts, cancer leaders and patient advocates to help to guide the national initiative. That panel also includes UC San Diego’s Maria Elena Martinez.